Air passengers at a growing number of U.S. airports will no longer need to remove electronics, liquids, and other items from their carry-on luggage at security checkpoints as the Transportation Security Administration rolls out new technology. The TSA took a major step in a broader plan to revamp its overall screening process with faster, more advanced technology when it signed a contract Thursday for hundreds of new carry-on baggage screening machines, Administrator David Pekoske said on a press call Friday. The agency has tested the new technology at more than a dozen airports since 2017, along with the relaxed protocols that allow passengers to leave items such as laptops and toiletries inside their luggage. The rollout of the computed tomography, or CT, machines will begin this summer, Pekoske said. The $97 million contract will buy 300 machines, but the list of airports receiving them has yet to be made final, Pekoske said. A Transportation Security Administration worker screens luggage at LaGuardia Airport in New York City. 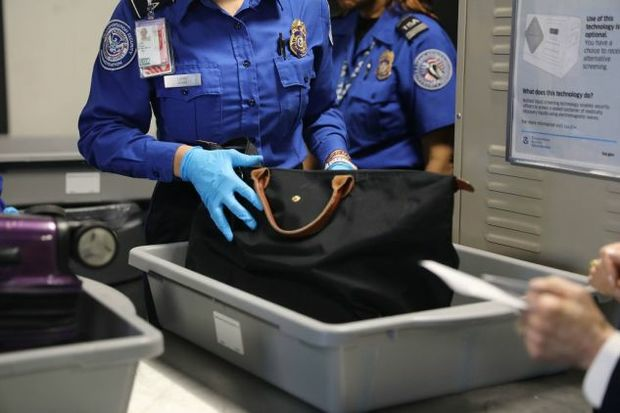 The technology creates 3-D images of bags’ contents and will eventually be able to detect items automatically that the TSA now asks passengers to remove, he said. “It’s not a little bit better, it’s a lot better,” Pekoske said of the technology. In total, the agency expects to replace its more than 2,000 X-ray machines with the CT equipment over the next eight years, he said. The five-year contract was awarded to Edgewood, Maryland-based Smiths Detection, but the next phase of procurement may include multiple vendors, he said. While the CT pilot program didn’t show reduced wait times at participating airports, the agency is expecting the technology will speed up lines as passengers and staffers get used to the new processes. Pekoske said he expected more staff to be needed initially as the new machines are put in place. President Donald Trump called for another 300 CT machines to be funded in his fiscal 2020 budget request released earlier this month.